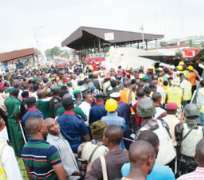 One of the five survivors of the Associated Airlines plane crash, who was also the flight technician in the October 3 disaster, has died at the Gbagada General Hospital, Lagos, where he had been receiving treatment. The death of that Mr. Samson Fatoye, at about 7pm on Wednesday brought to 16 the number of dead victims of the ill-fated plane which crashed while conveying the remains of former governor of Ondo State, Olusegun Agagu, from Lagos to Akure. Fatoye, who suffered severe burns from the crash, had been treated in many hospitals before he was finally taken to the Gbagada hospital. It was gathered that Fatoye died few hours after immigration officials from Abuja arrived in the hospital with electronic data capturing machine to prepare passport for the survivors to travel overseas for further treatment. It was also learnt that the remaining four survivors, including the two cabin crew members, were captured, using the machine and might be flown to overseas any time soon. However, there were allegations that the survivors had been neglected by both the government and the management of the airline. There had been reports that one of the surviving flight attendants, Mrs. Quinneth Owolabi, whose 10 toes and five fingers were amputated days ago, had been in severe pains before and after the surgery. The National Cabin Crew Association had reportedly appealed to the Federal Government to fly her abroad for treatment to avoid the amputation. Serving and retired cabin crew executives had expressed anger over government's refusal to come to the aid of the victim despite the appeal made by NACCA and the family. Spokesperson for the group, Mrs. Blessing Efe, had reportedly said that Owolabi would have been saved the trauma of amputation had government heeded her cries. Efe said, 'It is unfortunate that no help came when Quinneth needed it most. Her toes and fingers were amputated three days ago (four days today). Imagine the trauma she is going through at the moment. 'We want government to always support people who survive air crashes because the accident is not their making. The second surviving cabin crew member, Miss Toyin Samson, was said to be in a stable condition at the Lagos State University Teaching Hospital, Ikeja, where she has been on admission. - Punch.